Perfectly adds texture to any wall in your home, fits to any style, bohemian, yet modern and everything in between. A show-stopper of a housewarming present or a one-of-a-kind treat for yourself, and a way to display flowers, plants or even short candles! 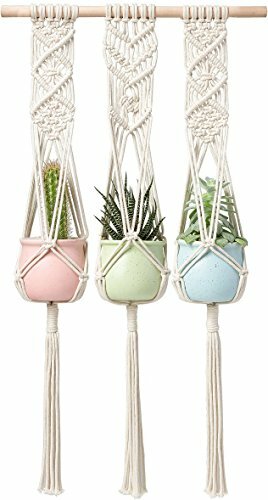 A triple macrame plant hanger to show your plants some love with this elegant, vintage-inspired design. Simple, yet meticulously handcrafted. No plant or flower pot included in this item! Material: Cotton Rope and wood dowel, beautiful and functional. This macrame plant hanger will add a lightness and relaxed feel to your space, suitable for indoor and outdoor use. Seperate use is available, you can cut the wood dowel down and divide into three pieces, meet you need if you like to display it in different place. Hang from the wall or suspended from the ceiling! Perfectly adds texture to any wall in your home, Make it your own by adding your favorite succulents, air plants, herbs, seasonal fresh cut flowers or even short candles. It holds multiple sizes of pots from small to large. Ideal for the planters up to 3-3/4" in diameter. In the picture 1, the flower pot shown is 3-3/4" in diameter, in the picture 2, the flower pot shown is 4-3/8" in diameter. Size: Macrame measure 30" in length (from top to bottom), wood dowel is near 16 3/4" in length. Mkono is a registered trademark and our product is professional manufacturing and sole selling.